Medi Terre is a new modern Class A Hotel, created for those who value comfort, exclusivity, non-intrusive quite service, and superior quality. The Hotel is located in a resort city of Netanya, virtually at the very seaside. Just across the road is a gorgeous recreational sand beach with umbrellas, sun loungers, and cozy coffee shops. Medi Terre is one of the best hotels in Israel, developed in accordance with the most current world standards. The hotel offers one and two bedroom apartments, as well as exquisite three- and four-rooms accommodations with Jacuzzi and personal dining room. Panoramic Deluxe RoomEnjoy the panoramic view of the Mediterranean Sea from huge windows and the balcony of the luxurious Panoramic Deluxe. These spacious, stylish, suffused with sunlight, and, at the same time, cozy rooms are custom furnished and designed. Furniture from the renowned Italian interior designer and manufacturer Gervasoni adds comfort and style to these rooms. The walls are decorated with photographs specially created for our hotel by a top-ranked landscape photo artist – Edward Stern. 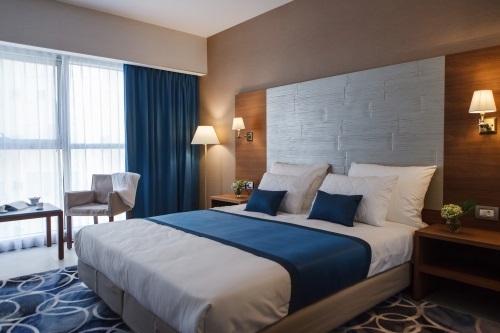 All the furniture and finishing of the rooms are made of environmentally friendly materials; the sophisticated climate control system adjusts the rooms temperature to the accuracy of one degree. The bathrooms are equipped with a rain shower unit and has under-floor heating system. There is also a cozy rest area with soft sofas and coffee table, separated from the main room area by a large screen made of natural bamboo. The room has a balcony with table and chairs with a wonderful look-out over the Mediterranean Sea. There is a large extra-length King Size bed (180-210 cm) with fine soft linen. 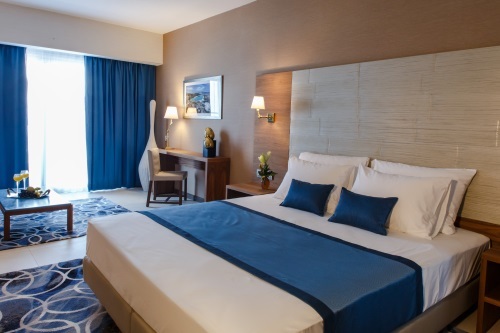 Deluxe RoomThese spacious, stylish, suffused with light and, at the same time, cozy rooms are custom designed and equipped with state-of-the-art accessories. Furniture from the renowned Italian furniture designer and manufacturer Gervasoni adds comfort and style to these rooms. The walls are decorated with photographs specially created for our hotel by a top-ranked landscape photo artist – Edward Stern. All the furniture and finishing of the rooms are made of environmentally friendly materials; the sophisticated climate control system adjusts the rooms temperature to the accuracy of one degree. The bathrooms are equipped with a rain shower and has an under-floor heating system. The room also has a cozy comfortable rest area with a small sofa and a coffee table. The room has a balcony with table and chairs with a wonderful look-out over the Mediterranean Sea. There is a large extra-length King Size bed (180-210 cm) with fine soft linen. 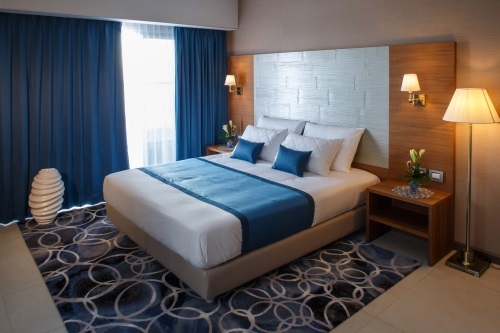 Family RoomThese cozy yet stylish double-room suites are custom designed and equipped with state-of-the-art accessories. Furniture from the renowned Italian furniture designer and manufacturer Gervasoni adds comfort and style to these rooms. The walls are decorated with photographs specially created for our hotel by a top-ranked landscape photo artist – Edward Stern. All the furniture and finishing of the rooms are made of environmentally-friendly materials; the sophisticated climate control system adjusts the rooms temperature to the accuracy of one degree. The bathroom is equipped with a bathtub with rain shower from Jacob Delafon. The room is equipped with two extra-length Single XL beds (90x210 cm) and one comfort armchair bed. Baby cot can be added upon request. A small separate room is equipped with a comfortable desk and chair. View from the window: calm and peaceful inner yard and amazing Mediterranean Sea side view and the nearby promenade. Standart Double RoomSmall cozy rooms. All the furniture (designed by a renowned furniture designer and manufacturer Gervasoni) and finishing of the rooms are made of environmentally friendly materials; the sophisticated climate control system adjusts the rooms temperature to the accuracy of one degree. The bathrooms are equipped with a large bathtub from Jacob Delafon with rain shower. The walls are decorated with photographs specially created for our hotel by a top-ranked landscape photo artist – Edward Stern. The room is equipped with one large extra-length King Size bed (180x210 cm) or two extra-length Single XL beds (90x210 cm). Standart SingleSmall cozy rooms. All the furniture (designed by a renowned furniture designer and manufacturer Gervasoni) and finishing of the rooms are made of environmentally friendly materials; the sophisticated climate control system adjusts the rooms temperature to the accuracy of one degree. The bathrooms are equipped with a large bathtub with rain shower from Jacob Delafon or by a shower unit with a rain shower. There is one large (110x210 cm) bed in the room. Medi Terre SuiteMedi Terre Suite is custom designed, the interior is thought to the smallest details and attracts by the combination of luxury and homey coziness. Medi Terre Suite consists of three hotel suits, ancillary facilities, and personal dining room, and covers the entire floor area. The total Suit area is 106 m2. Spacious, stylish and suffused with light rooms are custom designed and equipped with state-of-the-art accessories. Furniture from the renowned Italian furniture designer and manufacturer Gervasoni adds comfort and style to these suites. The walls are decorated with photographs specially created for our hotel by a top-ranked landscape photo artist – Edward Stern. 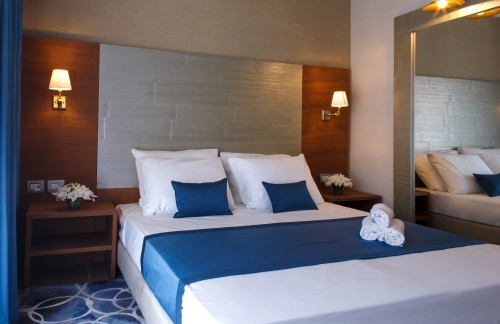 All the furniture and finishing of the rooms are made of environmentally friendly materials; the sophisticated climate control system adjusts the rooms temperature to the accuracy of one degree. Worth mentioning, is the luxury of a spacious bathroom with under-floor heating system. In addition to the rain shower unit there is a double Jacuzzi and a rest area with a small table and chairs, sauna, and a separate room for personal hygiene. Each room is equipped with a TV-set and a bathroom. Complex DeluxeThis spacious suite with a sea view with a total space of 82 m2 consists of two separate hotel rooms connected with a door. Each one of these rooms has its own bathroom, TV set and other accessories and equipment that create the atmosphere of combined coziness and luxury, so important for relaxation and comfort. Both large, stylish and suffused with light rooms are custom designed and equipped with state-of-the-art accessories. Furniture from the renowned Italian furniture designer and manufacturer Gervasoni adds comfort and style to these suites. The walls are decorated with photographs specially created for our hotel by a top-ranked landscape photo artist – Edward Stern. 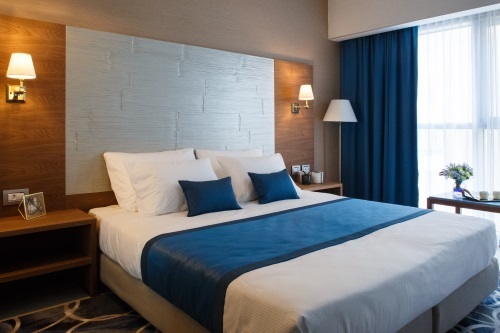 All the furniture and finishing of the rooms are made of environmentally friendly materials; the sophisticated climate control system adjusts the rooms temperature to the accuracy of one degree. One of the bathrooms is equipped with a bathtub with rain shower from Jacob Delafon, the other one – with a rain shower unit; both bathrooms have under-floor heating systems. There are cozy rest areas in each one of the rooms, with small sofa and coffee table. The areas are separated from the main room area by a screen made of natural bamboo. Each room has a balcony with table and chairs with a wonderful look-out over the Mediterranean Sea. Each room is equipped with one spacious extra-length King Size bed (180x210 cm). Senior RoomFor persons with special needs Two-room spacious, cozy room custom designed for people with special needs. Every detail of the room's equipment and design is considered in order make them comfortable for guests with special needs: wide doorways, bathroom with all the necessary accessories, hand-rails, bathing chair, telephone in the bathroom, and a large shower unit. Furniture from the renowned Italian furniture designer and manufacturer Gervasoni adds comfort and style to these suites. The walls are decorated with photographs specially created for our hotel by top-ranked landscape photo artist – Edward Stern. All the furniture and finishing of the room are made of environmentally-friendly materials, the sophisticated climate control system adjusts the room temperature to the accuracy of one degree. The bathroom is equipped with a rain shower unit from Jacob Delafon and with under-floor heating system. There are two extra-length Single XL beds (90x210 cm) in the room. According to your preferences, we can turn the small room into a cozy office with desk and chair or into an additional sleeping area. The room has an amazing side view of the Mediterranean Sea and the beach. 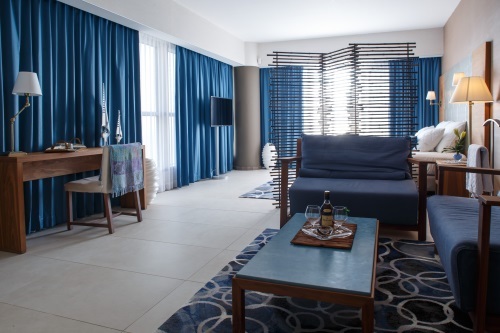 SuiteThis suite is custom designed, the interior of the room is thought to the smallest detail. It attracts with its superb style combined with homey coziness and comfort. The room has an amazing side view of the Mediterranean Sea and the beach. Suite consists of a spacious living room, luxurious bedroom, with a large extra-length bed (200x210 cm), separate cloakroom, and individual dining room. These stylish and suffused with sunlight rooms are equipped with state-of-the-art accessories. Furniture from the renowned Italian furniture designer and manufacturer Gervasoni, along with hand-made Persian carpets add comfort and style to these suites. The walls are decorated with custom made photographs on glass, created specifically for our hotel. All the furniture and finishing of the rooms are made of environmentally friendly materials; the sophisticated climate control system adjusts the rooms temperature to the accuracy of one degree. Worth mentioning, is the luxury of a spacious bathroom with under-floor heating system. In addition to the rain shower unit there is a double Jacuzzi and a rest area with a small table and chairs, sauna, and a separate room for personal hygiene. Superior RoomThese spacious, stylish, suffused with light and, at the same time, cozy rooms are custom designed and equipped with state-of-the-art accessories. Furniture from the renowned Italian furniture designer and manufacturer Gervasoni adds comfort and style to these rooms. The walls are decorated with photographs specially created for our hotel by a top-ranked landscape photo artist – Edward Stern. 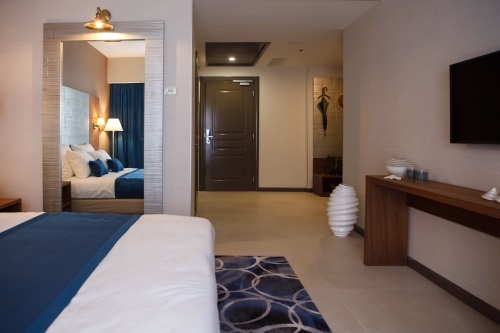 All the furniture and finishing of the rooms are made of environmentally friendly materials; the sophisticated climate control system adjusts the rooms temperature to the accuracy of one degree. The bathrooms are equipped with a large bathtub with rain shower from Jacob Delafon or a rain shower unit and has an under-floor heating system. The window overlooks amazing Mediterranean Sea side view and the beach. The room is equipped with one extra-length King Size bed (180x210 cm) or two extra-length Single XL beds (90x210 cm). Also, there is a comfort armchair bed in the room.